Next show Tues Sept 18th @ the Garrison — SAVE THE DATE! Next show WEDS August 15th! With a Magician!! Last show of the Summer, and we’re celebrating by, instead of having a MUSician, having a MAGician!!! Who, fyi, is amazing. Weds August 15th @ The Garrison, Dundas St West @ Ossington Ave.
Plus a story and a MAGIC TRICK from the amazing magician Scott Hammell! SEE YOU ON WED Aug 15th! Spread the word! Next show will be Weds August 15th at The Garrison – details coming soon but save the date! In the meantime, the videos from the (amazing, AMAZING!!!!) last show are up. If you were there, you’ll know how it was a bit magical, one of my faves we’ve ever had. THANK YOU to everyone who came along! More details about August 15th as they come in! Next show Tues May 29th @ The Garrison – FREE ENTRY! – TST fave and double Canadian Comedy Award-winner Sam Mullins! – WILDLY talented musician and Canadian folk award winner Abigail Lapell! – A coming out story that’ll have you yelling HOW DID YOU NOT KNOW????? – a terrifying story of life-saving friendship! All tomorrow! All FREE ENTRY! All at the Garrison, Tues 29th from 7.30pm onwards! Tues May 29th @ The Garrison, Dundas St West @ Ossington Ave.
Weds April 11th @ 7 p.m.
@ Onsite Gallery, 199 Richmond St. W.
Storytellers are: Sage Tyrtle, Hisham Kelati, Keira Loukes and David Keystone. The Sunshine Eaters is an original multi-sensory exhibition that highlights how artists and designers look to the land and its plants, flowers and trees as a means to imagine and conjure hope in the face of local and global crises. Featuring work by: Shary Boyle, Nick Cave, Robert Holmes, Jim Holyoak, Brian Jungen, Jessica Karuhanga, Alexandra Kehayoglou, Nina Leo and Moez Surani, Tony Matelli, Alanis Obomsawin, Ebony G. Patterson and Winnie Truong. Curated by Lisa Deanne Smith. Exhibition runs January 10 to April 15, 2018. 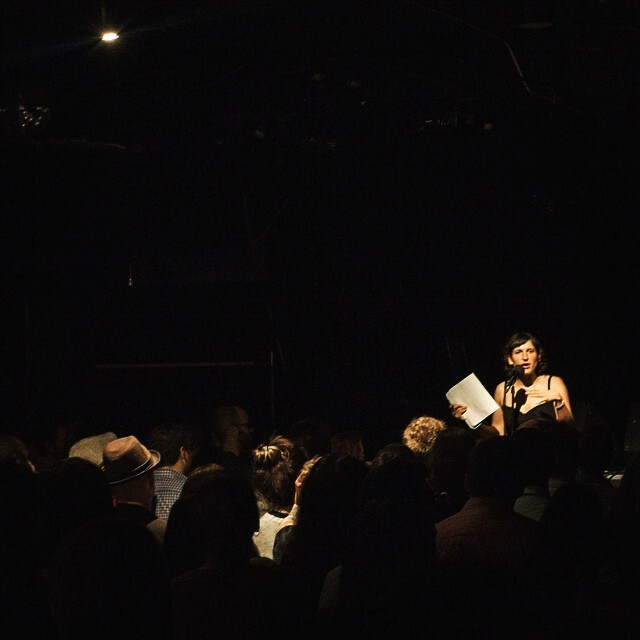 True Stories Toronto is the city’s biggest free storytelling show. For five years, hundreds of Torontonians have enjoyed the format of four storytellers and one storytelling musician, making intimacy in a big room in West Toronto. Thanks to everyone who came along to our 5th bday party – and thanks to the Storytellers! L-R that’s Kevin Breathnac, Diwali Luharia, Graham Isador, Marilla Wex, Zebulon Pike, Erin Rodgers and Me, Marsha. Not pictured but also on the bill were Sage Tyrtle, Paul Hutcheson and Rhiannon Archer. Our next show is part of the Toronto Storytelling Festival, and is on March 20th @ The Garrison. It’ll be FREE ENTRY and we’ll have more details soon, or just turn up on the night! Next show Feb 27th – TST 5TH BIRTHDAY SHOW!! It’s our 5th birthday!! So we’re bringing back some of our favourite stories – and storytellers – from the last 5 years! Tues Feb 27th @ The Garrison, Dundas @ Ossington. Featuring stories from TST favourites Paul Hutcheson, Sage Tyrtle, Graham Isador, Rhiannon Archer, Zebulon Pike, Erin Rodgers, Kevin Breathnac, Marilla Wex and more! Plus SURPRISES!!!! !